Bob is doing very well these days. He has been a little chesty – had a small bug but that seems to be on the way out – but today was not coughing at all really and was quite awake and looking at the guitar, following it as I moved it slowly within his line of vision. We’re still waiting to hear from the National Rehabilitation Hospital as to when they expect to admit him for his three-month assessment and therapy. It’s a huge step for us all after ten months of waiting and a bit nerve-wracking: our routine will change drastically because he’ll be further away and I probably won’t be able to spend as much time with him as now, but it’ll also be wonderful to know he’s getting input from trained professionals in neuro-rehabilitation who know how to get the best from him. Our routine is pretty much the same every day. I spend the morning and early afternoon with Bob when I bring him outside if at all possible. If it’s sunny, he’s covered in sunscreen and wearing his baseball cap, shorts and sunglasses. If it’s rainy we stay inside and I’ll give him a massage, play guitar for him, do passive physiotherapy or read to him. Sometimes we just sit together and do nothing. Every evening I’m there for a few hours and, again, if it’s nice out we’ll get into the air for a while. So Bob gets to sit out twice a day for at least five hours, sometimes six. This is very good for his chest and also his positioning, giving him a chance to look around. Getting him outside into the sun is really good for him, and being out of the room for a couple of hours each day. Ritamary comes one evening and Eamonn the next, so there’s always a second visitor in the evenings which is lovely for Bob (and for me!). Ritamary does textures, tastes and smells with Bob if he’s in the mood for it, and Eamonn does other things like playing the guitar or chatting. Recently a friend of Bob’s who worked with him in RTE and knew him from 38 years ago, John Connors, got in touch to ask if he could visit. He came across the blog by accident and emailed me. A lovely genuine person, John arranged to come out the other day and was a great visitor: chatting away to Bob about music and gigs they’d been at together, and I was very glad that he came. I think Bob was too. John says he’d like to visit again and we hope he does. The Bird Story ~ I had a lovely surprise this evening (3rd August): when I got to SJH for my second visit with Bob ~ he and our friend ‘super SCA’ Janet Doherty were waiting for me on the first floor foyer of the hospital. Janet had got Bob into his chair and brought him down to greet me. It was terrific. Bob and I had not been outside this morning because of the rain, so I talked Janet into coming with us for a minute while the sun was shining and it was dry. 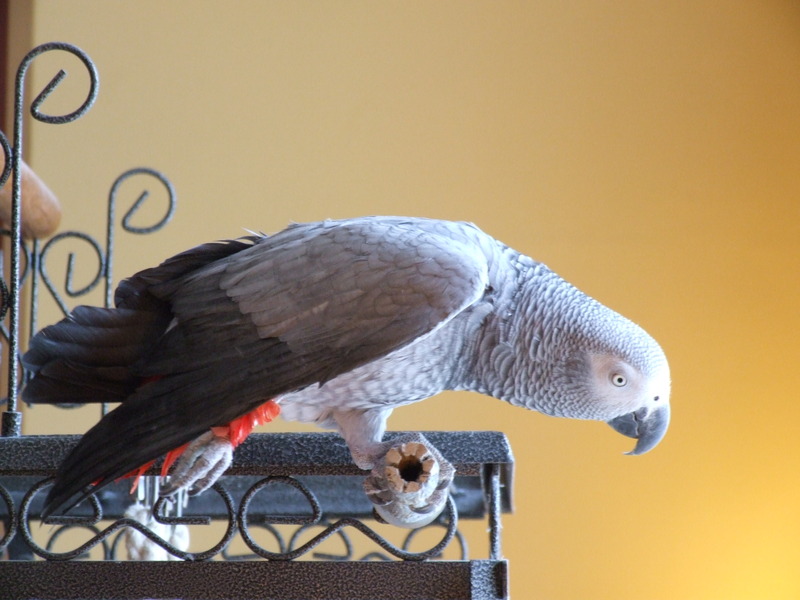 Janet has a thing about birds ~ when I told her about our African grey parrot Paulie (pictured above) who absolutely adores Bob (and kind of likes me), Janet almost ran from the room. She’s not kidding, it’s a genuine phobia. Unfortunately, when the pigeons and sparrows see Bob’s chair, they assume there’s food in the offing and often the pigeons walk after the chair waiting for the seed and bread that Bob and I dispense daily. It’s like a scene from ‘Creature Comforts’: six or seven pigeons walking in their weird way, following us up the path. This evening there was no food but the birds didn’t understand that ~ and they start to arrive, quite slowly. 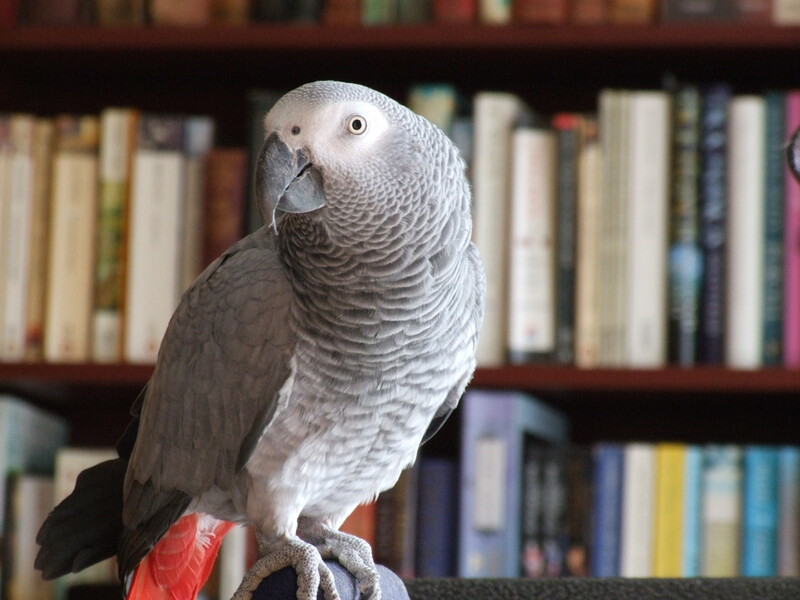 Janet jumped when a pigeon appeared, ducked when two sparrows flew overhead, and eventually started feeling ill when several sparrows and three pigeons were surrounding the chair and I was doubled over laughing. I mean, sparrows! I chased off a few pigeons but eventually it got too much for Janet and she turned Bob’s chair around and we ‘flew’ back inside. But I could not stop laughing. I’m sorry, Janet, for flapping my hands at you later on ~ it was irresistible. I won’t tell you the story of how Janet became wary of birds ~ it’s a good ‘un but it’s her tale to tell. By the way, Paulie’s on holidays with Ritamary and Bronwyn since March as she – Paulie, that is – needs lots of attention and input and right now I can’t really do that for her. So she’s getting lots of company and love with her auntie and cousin.